This review appeared in Main Post on June 22, 2012. 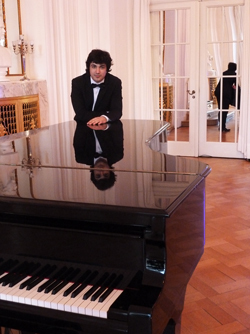 Just 21 years old Bulgarian pianist Evgeny Genchev drew a full house to the Regentbau Rossini Hall at the Praeludium Concert of the 2012 Kissinger Sommer Festival on Friday 22nd June. The young Bulgarian achieved this with so much brilliance and empathy for the high and late-romantic music world, bringing sheer delight to the listeners. He shone in Schumann's C major Fantasie Op. 17 drawing on emotional depths from this composer. Here he modeled the melody in the right-hand with the same plasticity as he did with the shining middle ground elegant chords. Surprisingly mature, Genchev had taken part in the 2011 Kissinger Piano Olympus, not only in Schumann, but also in pieces by Scriabin. His particular strength is demonstrated not least in rhythmic aspects, which he brought to bear at the Kissinger Sommer in the Scriabin 5th Piano Sonata, as if jumping over giant boulders. But with all his strength, he always kept the "reins in hand". The full throated passages he addressed with just the right amount of necessary vigour, as he did in the finely chiseled sections which certainly did not lack accuracy. He brought maximum technicality for one so young as well as a remarkable degree of safety. The dramatic landscape in Evgeny's soul was revealed to the audience, sometimes with expressive ferocity and sometimes with dreaminess. With tremendous suggestive powers as of a kidnapped wild Romantic Czech pianist, the often bitter beauty of the Russian composer bordered on the Modern. This effect was not achieved uncontrollably, but with ecstasy, as Genchev made his mark in interpreting the late Romantic period, showing that this type of piano music is more than a mere noise. His virtuosity was apparent not only in the highlighted expressiveness of sounds, but also in the structure of this remarkably contemporary music, played with a high degree of clarity and contour. How much power is packed into Genchev's interpretive skills was shown by the Bulgarian pianist who, in addition to the two of Scriabin's Op. 32 Poemes, delivered a stunning presentation of the B minor Fantasy Op. 28.